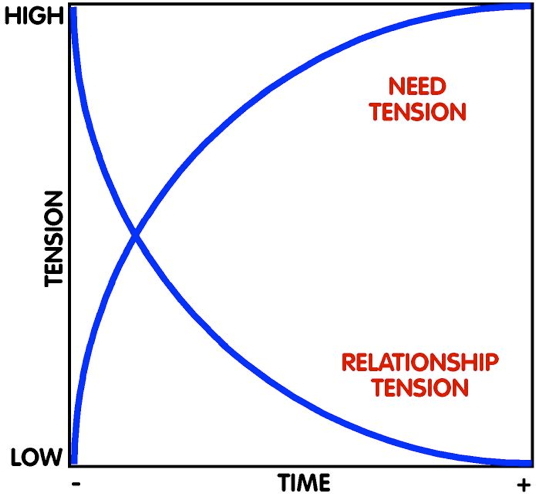 It’s difficult to say exactly when I began developing the concept we now refer to as Tension Management®, but I’ve been curious about what makes people tick since I took my first psychology class in high school. Each week brought a new theory proposed by a different psychologist and a rather animated discussion comparing and contrasting each approach. I was fascinated and frustrated at the same time. It seemed to me that they were all trying to explain the same thing — how we humans operate — and while they shared much in common, they just couldn’t agree on a single explanation for why people do what they do. Rather than argue about who was right and who was wrong, I decided to maintain an open mind — to simply listen and learn more — and allow the pieces of the puzzle to fall into place until I felt I had the explanation of human behavior I was looking for. Life went on and along the way I read dozens of books, listened to hundreds of hours of lectures and attended more seminars, workshops and retreats than any one person should probably attend always in search of the missing pieces. Some were very useful — many were simply drivel. Yet, through it all, I stumbled across a precious few that immediately struck me as clear, concise, versatile and valuable models for understanding the human enterprise. Some of the models are quite ancient, dating back 2500 years ago to the time of Socrates, Hippocrates, Plato and Aristotle. Others are much more recent, including work by such notable experts as Ken Blanchard, Tony Alessandra and Edward DeBono. So, without delving too deeply into the academic, scientific and historic details, here is a brief history of the most significant contributions to the “Merging of Brilliance” in the past 100 years. 1908 — Robert Yerkes, PhD and John Dodson, PhD — Harvard professors Yerkes and Dodson proposed the “Inverted U Theory” which subsequently earned wide-spread acceptance and became known as the “Yerkes-Dodson Law.” Their research sought to establish a measurable relationship between performance and “arousal,” which is best defined in modern terms as “physical sensory activity.” Their research showed that a moderate level of arousal was accompanied by peak performance while both high and low levels of arousal resulted in reduced performance. 1930 — Tsunesaburo Makiguchi — Famous Japanese educator and author of “The Philosophy of Value,” Makiguchi proposed a parallel relationship between perceived value and attention — a relationship based on intellectual activity. In essence, the degree to which an individual values a thing will dictate the level of attention that thing will command. In other words, if we don’t value something, we won’t pay much attention to it — in fact, we may not even be aware of its existence. On the other hand, present us with something we value greatly and it will consume our attention just as greatly. Finally, present us with a situation that threatens something we value and we will focus on it with all the energy we can muster. 1949 — Giuseppe Morruzzi, PhD and Horace Magoun, PhD — Among the 20th century’s most eminent neuroscientists and known best for their discovery of the brain’s reticular activation system (RAS), Morruzzi and Magoun presented a significant refinement to the Yerkes-Dodson Law. The RAS is the brain’s attention and motivation center and serves as a point of convergence where physical sensory activity about the outside environment and our internal intellectual and emotional activity come together — where our two worlds meet. 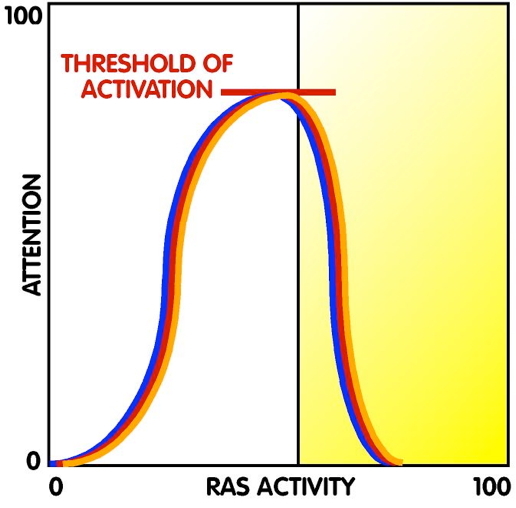 As activity in the RAS increases, so increases our attention — and once activity reaches a “Threshold of Activation,” immediate action is taken. The threshold can be reached though any one or combination of the three forms of activity — and can take anywhere from nanoseconds to an eternity to reach. Sudden flooding of the RAS results in overload and compromises our ability to focus on the situation. 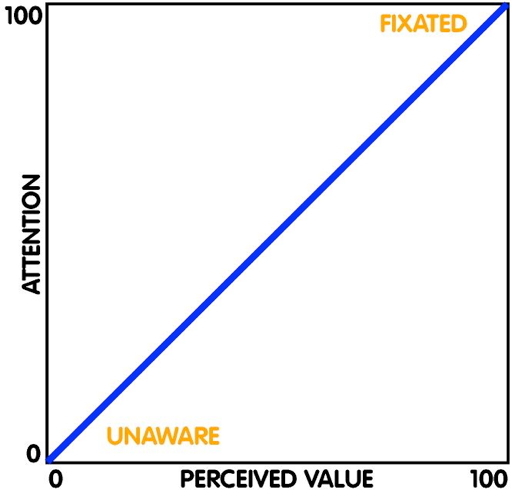 1959 — James Easterbrook, PhD — Easterbrook’s “Cue Utilization Theory” showed that arousal affects the selectivity of attention — specifically, what we pay attention to and what we ignore. The ability to tap into physical sensory cues and in turn use that information for productive purposes is largely dependent on an individual’s appraisal of a situation — the perceived demands of a given task and the perceived capability to meet those demands. If that appraisal results in a task being deemed too easy or too difficult, the ability to access and utilize information is compromised and performance suffers. On the other hand, when a relative balance is struck between demands and capabilities, the result is a feeling of being ready to meet the challenge. 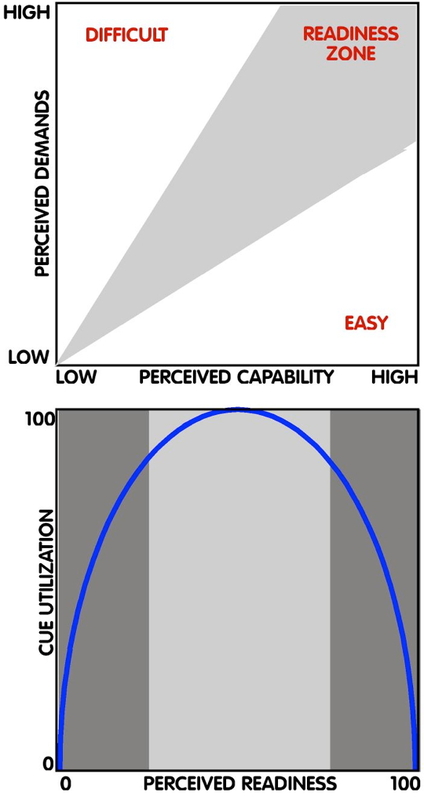 A moderate level of readiness optimizes cue utilization, while both very high and very low levels compromise the ability to tap into those resources. 1969 — Kenneth Blanchard, PhD and Paul Hersey, PhD — Blanchard and Hersey developed “Situational Leadership,” which is quite probably the most widely recognized and respected leadership model ever proposed. 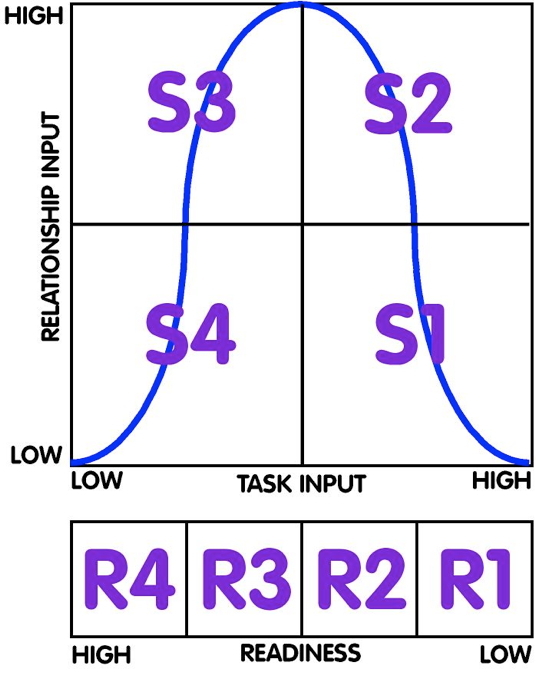 The model illustrates the need for flexibility in a leader’s style (S1, S2, S3, S4) based on the “readiness level” of each follower (R1, R2, R3, R4). 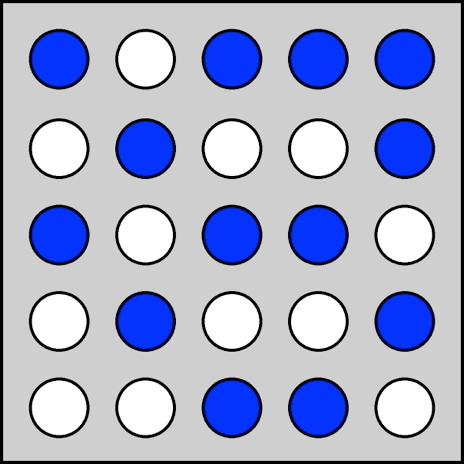 While Blanchard and Hersey’s focus is appropriately placed on the dynamic role of a leader, their most valuable insight for our purposes is the identification of a predictable pattern in follower behavior based on the interaction of the follower’s perceived ability to perform a given task and their willingness to do it. In a nutshell, as a follower’s perceived ability increases, there is a corresponding reduction in their level of commitment. By recognizing this as a normal event and responding to it in an appropriate and timely manner, a leader can modify their style and interact with the follower in such a way that growth continues and commitment returns. 1983 — Robert Dilts — Dilts is elite among the researchers in the earliest stages of the development of Neuro-Linguistic Programming. 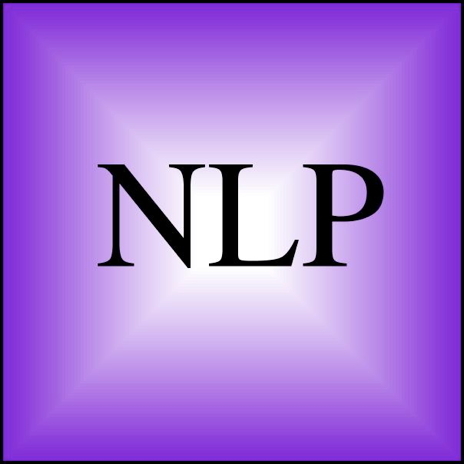 NLP is the study of the structure of subjective experience and was started in the mid-70s by John Grinder and Richard Bandler. Its basic premise is that each individual processes information about the world around them differently — and the way they process that information is revealed in the language they use when describing their world to others. In his book “Applications of Neuro-Linguistic Programming,” Dilts applies NLP to a wide variety of professions, including sales, and provides a set of tools and techniques that support the natural process of buying. While many popular programs present the most basic and superficial concepts of NLP — specifically it’s rapport-building techniques — the fact is that NLP’s greatest value can be realized only by an individual who has devoted years of their life to learning and developing proficiency in its many techniques. Nevertheless, NLP does hold great promise as a tool kit for communicating most powerfully and should be integrated by the more experienced tension management professionals. 1984 — Robert Kreigel, PhD and Marilyn Harris Kreigel, PhD — Authors of “The “C” Zone: Peak Performance Under Pressure,” Kreigel and Kreigel proposed a much more practical model for understanding human behavior. Their model explains that performance can be predicted based on an individual’s perceptions of the difficulty they face and the abilities they possess to meet it. 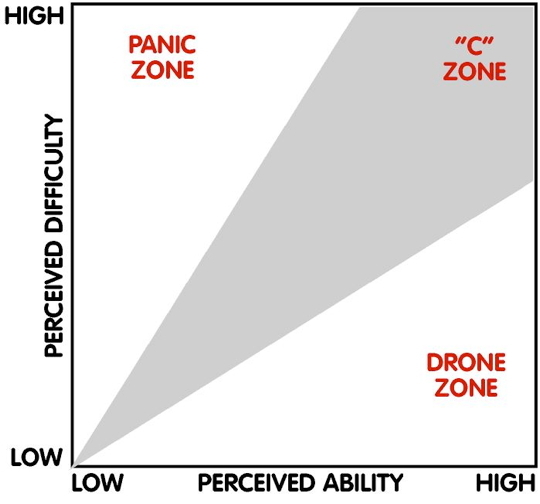 This results in the individual falling into one of three “Zones.” When difficulty exceeds ability, they enter the Panic Zone — when ability exceeds challenge, the Drone Zone — and when perceived challenge and perceived ability are in balance, the “C” Zone — confident and committed. 1984 — Robert Fritz — In his book “The Path of Least Resistance,” Fritz offers three principal insights for understanding the natural way that things occur. 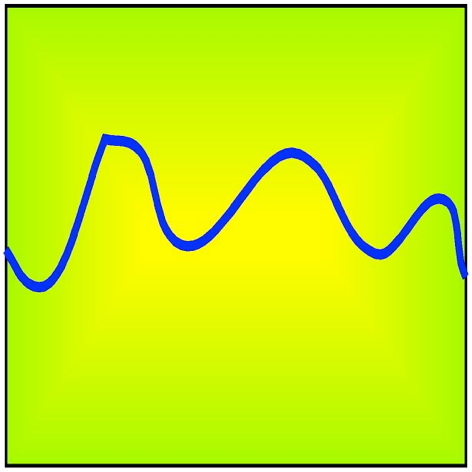 First, all forms of energy follow the path of least resistance. Second, the underlying structure of a situation dictates the path of least resistance. Third, the path of least resistance can be altered by changing the underlying structures. From this, it’s easy to understand that selling is a process of managing energy flow (tension) and that every sales situation has an underlying structure which dictates how that energy flow will most naturally occur. 1984 — T. Falcon Napier — The first “Merging of Brilliance” and birth of the “MasterStream® Strategic Framework.” Divided into two sections, the “ChangeGrid®” portion reveals the level of productive tension an individual is experiencing about a particular situation. The “MasterStream®” portion shows the ideal flow of tension throughout the change process. 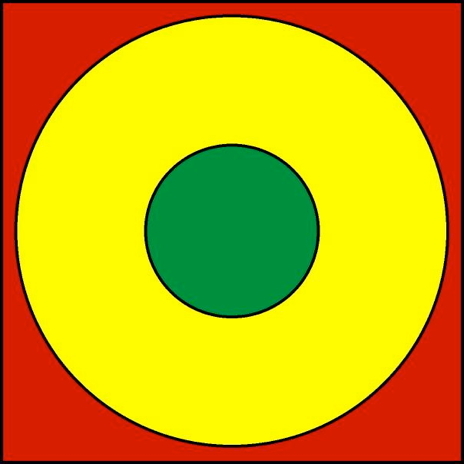 1985 — Edward DeBono, PhD — One of the world’s leading experts on creativity and author of “Six Thinking Hats,” DeBono offers us a simple and clever model for maximizing our thinking abilities. 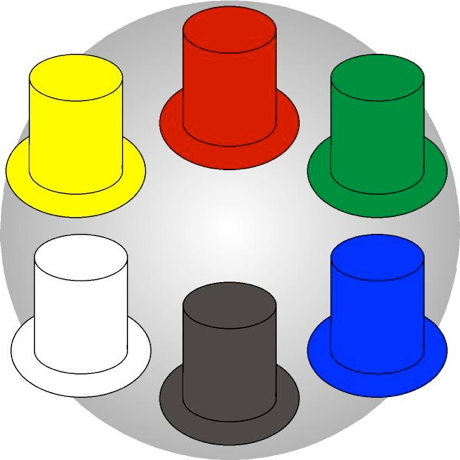 He describes six different colors of hats each of us wears and associates with each a specific way we use our minds, which incorporates the full range of mental vantage points: facts, goals, feelings, solutions, obstacles and control. Examining this concept from a tension perspective, we can weigh the relative level of production inherent in each mode of thinking and sequence them into logical orders for managing tension flow. 1985 — Tony Alessandra, PhD and Jim Cathcart — The attempt to divide the population into a set of personality types has a long, long history dating all the way back to the time of Hippocrates. Thankfully, in their model “Relationship Strategies,” Alessandra and Cathcart integrate them all into a single practical tool for understanding people. Their work blends models proposed by the topic’s most notable researchers, including: Jung’s “Psychological Types” (1923); Marston’s “DISC” profile (1928); the Myers-Briggs Type Indicator (1962); “Keirsey Temperaments” (1978); and Merrill and Reid’s “Social Styles” (1981). These models (and literally dozens of variations) describe 4, 8, 9 or 16 different “archetypes.” Each model employs its own instrument used to reveal what an individual’s archetype may be. Some contend that personality is immutable … some say it changes naturally over time … some say it’s specific to the situation … others say that with proper guidance anyone can change anything about themselves they wish. For our purposes, these models provide yet another layer of descriptive detail useful in the interpretation of an individual or group ChangeGrid® — and their integration results in a surprising realization for anyone interested in per¬son¬ality profiling! 1987 — Ann Wilson Schaef, PhD — Author of “When Society Becomes an Addict” and co-author of “The Addictive Organization,” Schaef brings a new dimension to our understanding of human behavior — how addiction and co-dependence have impacted decision making at the individual, family, organizational, governmental, societal and global levels. 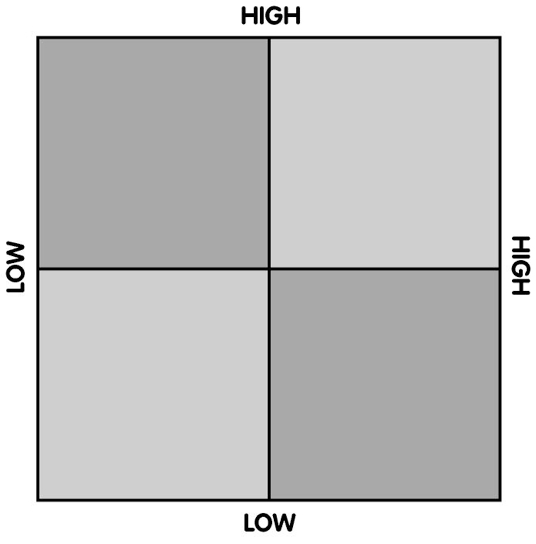 Addictive and co-dependent behaviors distort reality, compromise cue utilization, disturb RAS functioning and result in the need for higher and higher levels of arousal to be met before action is taken. Put simply, people today have an increasing tendency to put off doing what they logically know they need to do. 1988 — John Bradshaw — Offering even more fuel for our concern in his book “Healing the Shame that Binds You,” Bradshaw identifies shame as a disease of the human spirit and exposes it as the ultimate source of our demise. Bradshaw describes both healthy and toxic shame and provides a way for identifying, understanding and eliminating shame in our personal and professional lives. 1988 — Wyatt Woodsmall, PhD — In contrast to the widespread adoption of personality typing, Woodsmall offers a much more precise way to describe behavior in his book “Human Typological Analysis.” Woodsmall provides a comprehensive set of individual-specific “programs” that each of us uses in evaluating and interacting with the world around us. By identifying an individual’s natural programming — their “native language” — effective communication can be greatly enhanced. 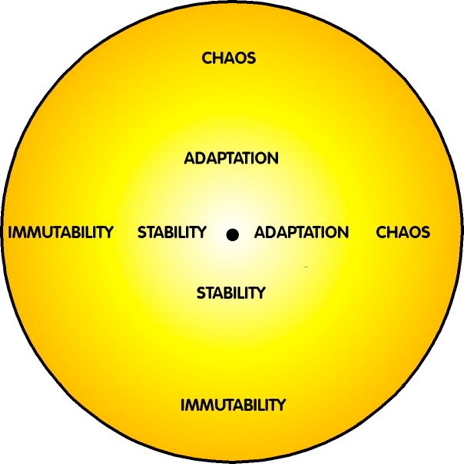 1989 — PA Hancock, PhD & JS Warm, PhD — Fifty years after Yerkes-Dodson proposed the Inverted U theory, Hancock and Warm developed the “Extended U” theory which offers a more sophisticated explanation of human adaptability and instability. 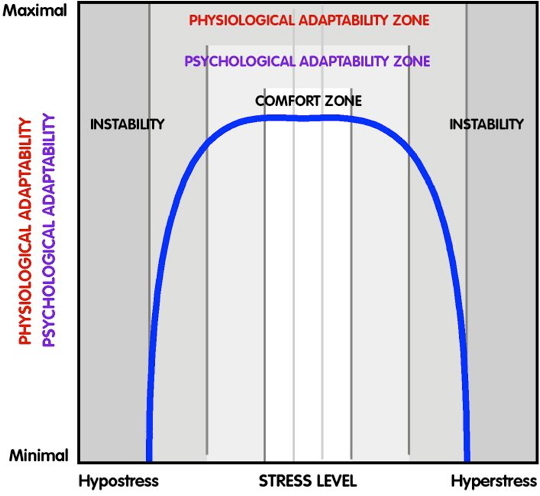 It integrates all forms of activity — physical, emotional and intellectual — and explores how the level of “stress” creates a range of psychological and physiological “adaptation zones” leading to chaos, adaptability, stability and immutability. 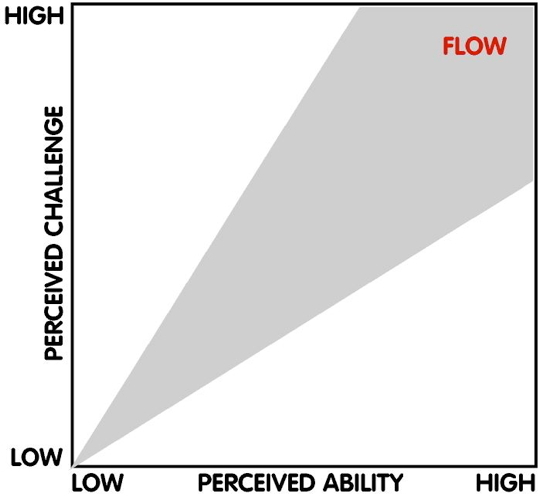 1991 — Mihaly Csikszentmihalyi, PhD — Professor at the Drucker School of Management at Claremont Graduate University and author of “Flow: the Psychology of Optimal Experience,” Csikszentmihalyi explores a state of happiness he refers to as “flow.” Flow occurs whenever an individual is focused on a task they have personally chosen and clearly defined — one they perceive as both challenging and appropriate for their abilities. Based on over 250,000 surveys conducted around the world, his work thoroughly illustrates the principles presented by many of the researchers highlighted in this introduction. 2002 — PA Hancock, PhD & JL Weaver, PhD — The topic of “Temporal Distortions Under Extreme Stress” is representative of state-of-the-science thinking about human behavior. 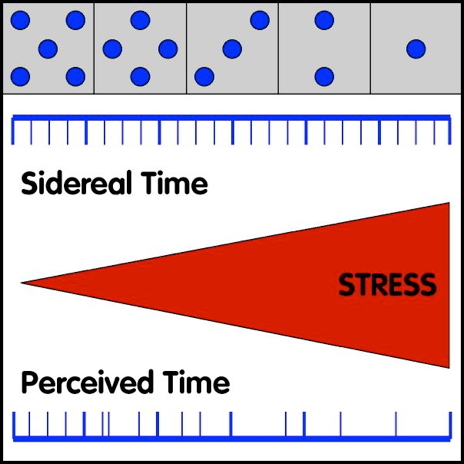 Here, Hancock and Weaver propose that as our level of stress increases, our perception of the passage of time becomes distorted and as it does so, the number of things we can pay attention to is compromised, leading to “load-shedding.” I’m not entirely sure how this fits in — nor how useful its integration would prove to be in the world of professional sales, but it does make you think — and thinking is what has made Tension Management® what it is today. If you took the time to study each of these models as I have for the past 30 years, you’d find that they all make a great deal of sense — and I think things that make sense individually should make even more sense together. So I’ve devoted my career to integrating all of them into a single model — a “Strategic Framework” for understanding behavior and streamlining change at the human level. As shown above and explained throughout this website, I found that they do indeed fit together — conceptually and visually complementing, clarifying, reinforcing and refining one another. Many more models and concepts have been integrated over the years — some providing only reinforcement while others an additional insight or tool — and many more will be integrated as our understanding of human behavior expands.